Sweet creativity app turns kids into candy makers. A magical 2D block world is waiting for your child's imagination! 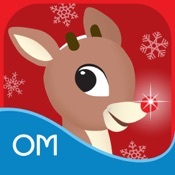 A version of the Rudolph the Red-nosed reindeer story based on a 1964 TV special that is filled with adventure. In this fun holiday mashup, a Halloween witch must save Christmas! Lackluster delivery of the story from The Peanuts Movie. Kids frolic with fish and animals that live in kelp forests. Tower defense game about using math to defeat cute monsters. Pictorial coding game that is too hard for intended 4-year-old players. A fairy tale mashup full of clever surprises, where the words come alive to solve puzzles. Puzzle fun, where kids 'gear up' to learn engineering principles. Kids tinker with everyday objects to create Rube Goldberg-like machines in this series of puzzles. Kids become robot inventors, and then test their wacky creations in a challenging obstacle course. DisMonster - Catch the shadow! Instead of being afraid of the monsters in the dark, kids unmask the ghostly forms to see the real objects causing the shadows. Kids use the zoom feature of the iPad to enter and exit five fantastical worlds. Combining science and reading, this app sends kids romping with a baby dino and then chronicles the journey by turning it into a storybook.